Note: The Commander-In-Chief Forum special listed below is a combined rating of both NBC and MSNBC viewership for the simulcast. CABLE HIGHLIGHTS: HARLEY AND THE DAVIDSONS ended its strong run for Discovery at 0.88, and ended in time for a 12-minute preview of SACRED STEEL, which held its lead-in nicely at 0.72. Bravo’s REAL HOUSEWIVES OF NYC ticked up to 0.62. OWN’s QUEEN SUGAR, this time with its own rerun as lead-in, was quite sweet at 0.61. On Lifetime, LITTLE WOMEN LA gained 0.07 to 0.59, and LITTLE WOMEN ATLANTA was up 0.02 to 0.55. MSNBC’s simulcast of its mother network’s COMMANDER IN CHIEF FORUM added 0.50 to the score, and with 3.4M total viewers, it was the most-watched cable show of the night, beating out usual leader Fox News. On USA, SUITS rose 0.03 to 0.50, and MR. ROBOT was also up 0.03 to 0.29, with after-show HACKING ROBOT at 0.12. MTV’s CATFISH climbed 0.08 to 0.43, and UNLOCKING THE TRUTH added a tick to 0.18. On HGTV, HOUSE HUNTERS INTL ticked down to 0.40, HOUSE HUNTERS was up 0.02 to 0.39, and PROPERTY BROTHERS was down 0.02 to 0.37. On ID, HOMICIDE HUNTER fell 0.05 to 0.34, and BETRAYED held at 0.28. History’s PAWN STARS ticked up to 0.33. VH1’s DATING NAKED gained 0.06 to 0.27. Food Network’s CAMP CUTTHROAT dropped 0.07 to 0.27. FX’s TYRANT exited quietly, as what turned out to be its series finale lost 0.03 from last week to 0.21. TLC’s TODDLERS & TIARAS was down 0.02 to 0.20 and LOVE AT FIRST KISS was up 0.01 to 0.15. 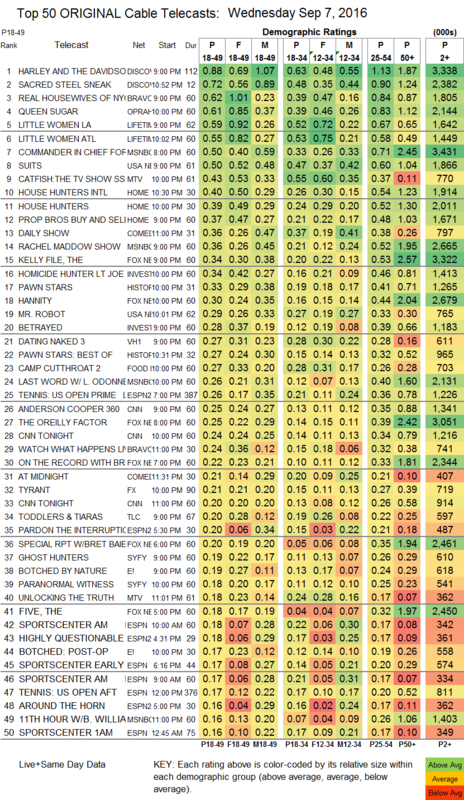 On Syfy, GHOST HUNTERS fell 0.08 to 0.19, and PARANORMAL WITNESS was down 0.06 to 0.18. 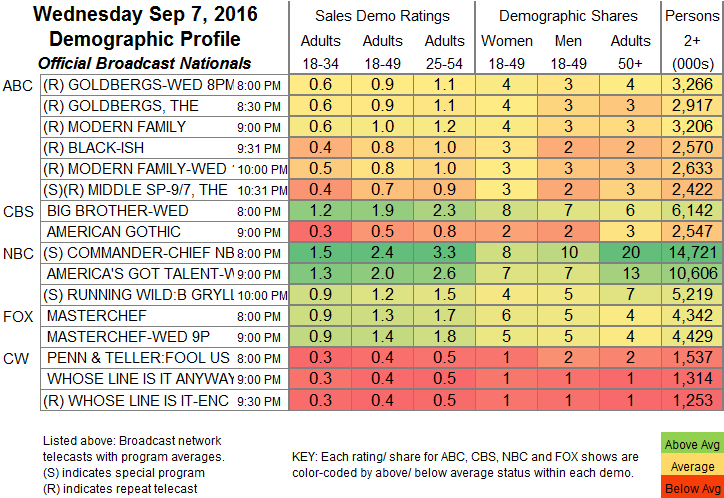 E!’s BOTCHED BY NATURE was at 0.19, with an after-show at 0.17. FXX’s YOU’RE THE WORST dropped 0.05 from last week’s season premiere to 0.12.